There is NOTHING in this world better than a fresh cup of coffee. And by fresh, we’re talking about not just freshly brewed, but also freshly ground beans! This is how the true coffee lovers do it. That’s why there are so many coffee makers with grinders out there, but what are the best ones for the truly picky? Here are my top 3 best grind and brew coffee makers out there, the pros, cons, and what you need to know before you buy. When coffee is ground, the friction with the grinder blades causes the beans to heat up. This, in turn, causes the oils and antioxidants to degrade. Once the coffee is turned into coffee grounds, it is exposed to oxygen and thus more likely to oxidize. No, the coffee won’t rust, but the antioxidants, flavonoids, and natural oils in the coffee slowly break down. If you don’t keep the coffee in a perfectly air-tight container, a certain amount of degradation is guaranteed. Why do you think the best coffee machines grind the coffee right before brewing? There’s a lot of confusion out there about the proper way to store beans, but I’ve got you covered. If you want to know the best way to store coffee beans, you can read my full article with helpful tips. If you want the freshest cup of coffee possible, you want a grind and brew coffee maker. These machines store whole coffee beans in a hopper, ready to grind when you’re making a cup of coffee. They’re the perfect option for the perfect cup of coffee, and they will ensure you get the maximum flavonoids, antioxidants, and flavor in every cup. We’ve done the research to bring you the BEST grind and brew coffee makers on the market. 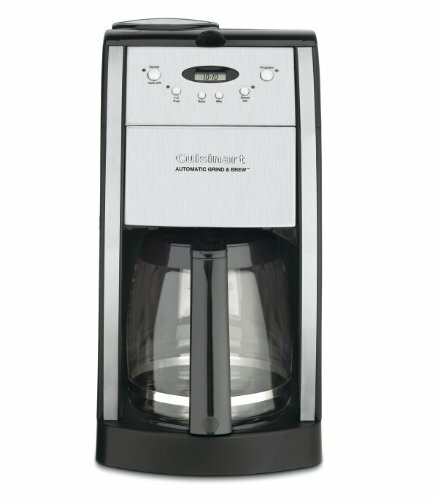 These coffee makers are durable, well-priced, and designed to produce the freshest cup/pot of coffee possible. Read on to find out what makes them your best choice for that gorgeous cup of coffee every day. If you’re looking for a grind and brew coffeemaker that will churn out the freshest, tastiest cup of Joe, this is the one for you. First off, it comes with 24-hour programming, allowing you to set it to automatically grind and brew a fresh cup of coffee every morning. 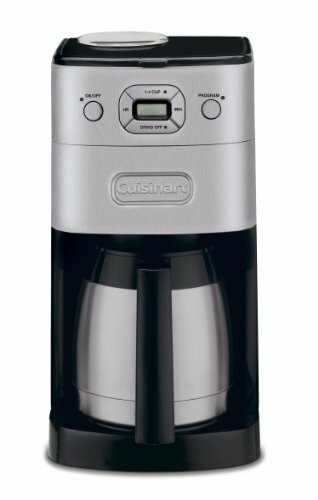 It can brew up to 12 cups (6 normal-sized mugs) at once, and it comes with excellent user-friendly features like an auto-shutoff to reduce energy use, brew-pause to allow you to serve yourself mid-brew, and the smaller brew setting to make higher quality coffee. For those who like their coffee a bit stronger, the 1-to-4-Cup setting will produce a brew with more potency and flavor. The brewing process is slower, but it’s so worth it to get that fresh cup of high-quality brew. This is actually a fairly well-priced coffee machine, despite its excellent quality. You pay just under $100 for this user-friendly, uber-convenient coffee maker. Check out the latest prices and discounts. 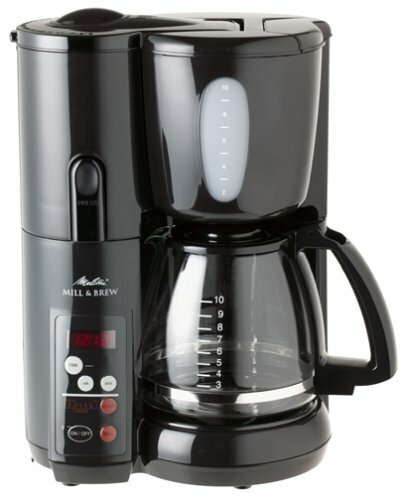 If you like to wake up to the freshest possible cup of coffee every morning, this is by far the best machine for you! If you like to have more control over your coffee, you’ll want to give this coffee maker a try. It has 7 settings to allow you to brew the coffee just the way you like it, and you can make your brews as strong or mild as you like. Thanks to the built-in stainless steel filter, you’ll never need to buy paper filters again. The machine is as easy to clean as it is to use. The electronic LED clock and timer allow you to program the coffeemaker up to 24 hours in advance, and you have a wide range of programming options to determine how fine you want the ground, how strong you like the coffee, when to brew, and how much to brew at once. If you run out of whole beans, the machine is capable of handling ground coffee. The machine is set to automatically shut-off one hour after run time, thereby reducing energy waste. It will also stop brewing the second you remove the thermal carafe from the warming plate. It’s designed to prevent messes and waste as little of your liquid gold as possible. This is a pricey coffee maker, relatively speaking (compared to the other coffee maker with grinder options). Check out the latest discounts and prices. However, the sad truth is that the machine has been discontinued by Melitta, so you can only find them used. Despite that, the used machines are better quality and higher-rated than most of the brand new models currently available on the market. Worth it! If there is one thing most people can’t stand, it’s coffee gone cold. This machine prevents that from happening! It doesn’t matter if your spouse gets up hours earlier—the double-wall thermal stainless steel carafe will keep the coffee nice and hot for hours. When you come down to serve yourself, it’s fresh and perfect. The gold tone filter and charcoal water filter will eliminate a lot of the impurities from the water you use to make your coffee. The result: better-tasting coffee. All of these things combine to make one heck of a great machine! At less than $100 as of this writing, this is a well-priced coffee maker. It may have a few hiccups, but overall, it delivers a great cup of the freshest coffee possible. Check out the latest discounts and prices.